I am a member of a wonderful blogger program called Perky-Pet® Blogger Review Panel. As a part of this review panel, we receive a bird feeder monthly to review and give our opinion! I received the Perky-Pet® Copper Sip & Seed Waterer. This bird feeder is a beautiful bird feeder and is really neat. One side is for seed and the other side is for water. OR you can use both for feed or water. Providing fresh, clean water to wild birds. 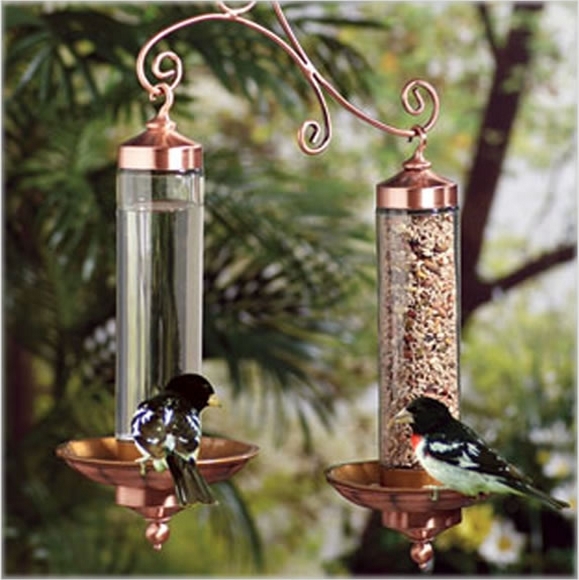 A water source in your backyard is a simple and effective way of attracting wild birds. Water attracts species that you may not see at your seed feeder. My kiddos and I were so excited to become part of this program! We tore open the box as soon as the bird feeder arrived. The kids put it together, filled it up with water and ran outside to hang it out. After a few days we filled one side with seed. I have to say this was one of the best reviews I have done. I like that it involved the whole family and is very educational. When we see a bird we try to guess what kind of bird it is. I have the feeder hung on a big tree right by my window so I can see the birds stopping in to it. 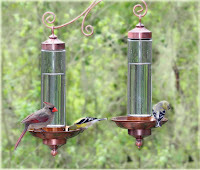 We have seen many different types of bird stop in and feed. This has been a wonderful family friendly review. The kids point out all the different birds that stop by. disclosure~ I received a copper sip and seed bird feeder from Perky Pets for my review. All opinions are my own.